In a new report launched on the 23rd July 2015, independent think tank ResPublica argues for the restoration and democratisation of beauty in public policy. Based on findings from a public poll conducted by leading pollsters Ipsos Mori, A Community Right to Beauty explores the public’s attitudes towards beauty and perceived local access to beautiful spaces. The report finds that households with incomes higher than £45,000 a year are the most able to access beautiful places and green spaces. It highlights the health, economic, social and civic benefits of living near beautiful surroundings and its policy recommendations set out a range of new powers and incentives to support the democratic discernment of what makes a neighbourhood beautiful, and communities’ ability to independently shape their locale. The launch of the report featured a panel discussion chaired by report co-author, and Deputy Director of ResPublica, Caroline Julian. ResPublica director Phillip Blond introduced the discussion and joining the panel were Sir Terry Farrell; former Conservative Minister Nick Herbert MP; Lloyd Grossman, Chairman of the Heritage Alliance; and former Chair of the National Trust, Dame Fiona Reynolds. Terry Farrell related the report findings to the Farrell Review concept of “improving the everyday” in the public realm. Loyd Grossman, too, said: “We are good at looking after our ‘trophy’ sites but not the everyday”. Grossman referenced the Beveridge Report of 1942, which identified squalor, alongside ignorance, want, idleness, and disease, as one of society’s five “Giant Evils”, suggesting that of the five it has been the least addressed by governments in recent years. Dame Fiona Reynolds, who is currently writing a book on beauty, reiterated the idea that the post-war tranche of legislation had beauty as one of its values and she welcomed the ResPublica report for putting this value back centre stage. Reynolds criticised George Osborne’s plans for granting automatic planning permission for homes built on brownfield sites, saying that the deeper meaning of beauty should “capture some of the principles we need to see in a sustainable society”. The publication is timely. Phillip Blond pointed out that with the Localism Act coming up for renewal, “this is our legislative opportunity”. ResPublica wants to pilot the project; getting local councillors on board to take the first steps in universalising the “community right to beauty” which they want to see introduced via primary legislation. Blond dismissed the idea that beauty is subjective; arguing that in fact it is unusually objective for an agenda item in politics. 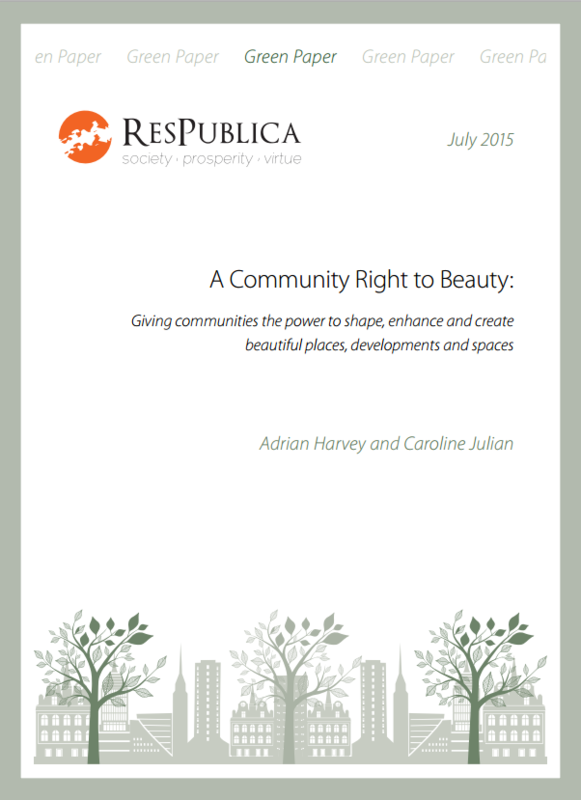 The panellists took a long view of beauty and its place in planning, and the ResPublica report shows why the findings of this long view – namely that communities respond to beauty in their surroundings – need to be safeguarded by legislation. • The public should have the power to choose their preferred design and developer. Communities should be consulted on proposed new developments, a range of options should be subject to a local vote. • Citizens’ Juries would oversee problematic developments. Residents supported by experts working within a public budget would make decisions that the local authority would be bound by. • A Community Right to Reclaim land should be extended to buildings and other local assets to enable the public to challenge authorities to improve derelict or unsightly developments. • To incentivise visual improvements that communities want there should be Capital Gains Tax relief for developers. • VAT relief on refurbishment costs, where a community calls for or takes a lead on improvement to a building. For buildings listed as ‘Local Beauty Assets’ (see below) the relief should be greater. • A system similar to Business Rates Retention, which helps economic growth, should be used to recognise the value a beautiful development adds to an area. • Areas of Outstanding Urban Beauty: Similar to Conservation Areas these would recognise beauty that isn’t just historic or green. • Buildings, areas and spaces with local importance should be labelled ‘Local Beauty Assets’ and preserved and maintained. • Areas without much visual appeal should be designated Community Improvement Districts. In these areas communities would be empowered to demand policies to tackle problems such as Litter Abatement Orders where litter is an issue. The report is supported by the National Trust, Campaign to Protect Rural England, the Woodland Trust, Ecclesiastical Insurance, Atlantic Gateway Parklands, Hastoe Housing Association and Civic Voice. Read the report summary in our research section.